Our hair & beauty salon in Deptford has a wide variety of treatments that are designed specifically to make you feel your very best: from locked curls to stylish up dos, our stylists will make it happen. We aim to use the very best products available on the market in order to give you that healthy glow that your hair deserves. We aim to get you feeling your best in just one relaxing session; you’ll be ready to paint the town with your new locks. 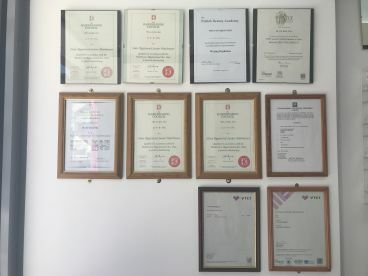 No matter the service you want doing, from perms to highlights, we advise and recommend that which we think will suit you, so whatever your look, we’re here to complement it.\n\nWe are very proud of our ability to bring time-old therapies and ritual remedies that have healing and relaxing results. Inspired by ancient Thai traditions, our remedies have an enormous amount of undeniable effects on your skin, muscles and mood. 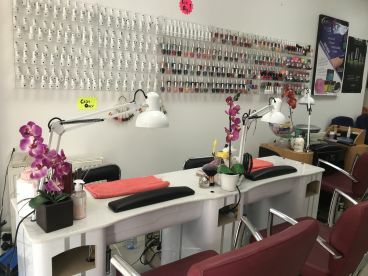 Our professional highlights, nail art and waxing services all have a cleansing, invigorating effect on your personal style, while our thorough body massages use techniques like kneading, friction and hot stones to relax your muscles. This has the combined effect of raising your mood, eradicating stress and leads towards healthier living.\n\nTime for a new look? We’ve got the skills and products required to embellish your dry, brittle hair and turn it into something fabulous! Treat yourself to the best products available on the market and leave us feeling rejuvenated and invigorated, rocking a new hairstyle which will give you that extra bit of confidence. Whichever look you desire, our stylists are here to help and pamper you into perfection. Our hair stylists want only the very best for their clients, so if you want top quality hair cuts and ravishing new styles, our salon is the right place for you. Very nice nails, so happy with my personalised design and finish ? 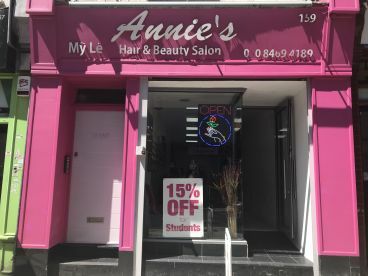 Please note that Annie’s Nails & Beauty Salon may not be able to honour booking requests made.